We had to let go of our bright, shining star Tasha II today. Her health had begun to decline over the past year. Her vision and mobility were affected by a degenerative nerve condition. But she was still Tasha, shining bright and making everyone smile. Within just a few short days last week, that slow decline sped up. And her bright personality began to dim. Her organs were slowly declining. It was when Tasha’s mental state dramatically declined, and she stopped engaging in the daily activities that made her so happy, that she clearly told us it was her time. Tasha’s shining spirit brought so many people together. After escaping the garage of her first home, where she’d lived for 9 years, she was rescued by a wonderful couple. But when laws became stricter in Ohio where they were, they contacted us to help Tasha and other cats. They knew we’d provide them a safe and wonderful life. I remember seeing Tasha for the first time. If her crossed-eyes and head tilt didn’t make her endearing enough, her pure bliss for life did. She was in a 10 x 20 area filled with more toys than you could count. And she played and showed off with every one of them before hopping on a platform, tilting her head and inviting you to play through the fence. Tasha brought so many special people together. 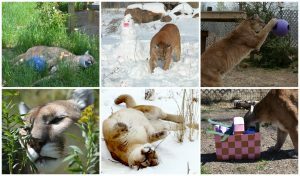 Three wonderful sanctuaries came together to help Tasha and all the animals. It also brought the support of IFAW, Tim Harrison of Outreach for Animals and all of you together! And her former rescuers remained involved in all their lives. She was so lucky to be loved by so many. And we were so lucky to have known her. Tasha treated everything as a new playground. When she first arrived, her toys never stopped moving. She was dribbling them and in motion all the time. As she aged, she loved her firehose hammock and loved to greet everyone with her signature Tasha chirp. But that wasn’t enough. She always had to come up in person to say “Hi!” and to share her joy. Now, instead of walking past Tasha, our bright shining star each day, we just look up to the sky and see her shining down on us. We feel blessed to have had you in our lives Tasha and thankful for all the new friends you introduced us to. May you continue to shine bright with the pride on the other side. and the animals she had in small cages in her backyard. Though she wanted to provide more for these animals, she’s struggled financially to keep up and was fearful she wouldn’t be able to meet the regulations the new legislation would require. 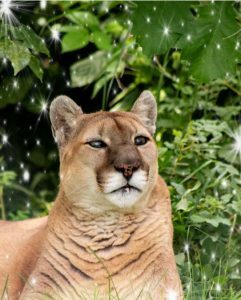 She researched different sanctuaries and contacted The Wildcat Sanctuary because she felt we could offer what her animals deserved – a home for life, where they wouldn’t be uprooted again and where they would have the open space she couldn’t provide for them. Sadly, the story of her animals and what they’ve been through is as heart wrenching as many of those who died that day in Zanesville, Ohio. And, like most others, hers is not their first home. 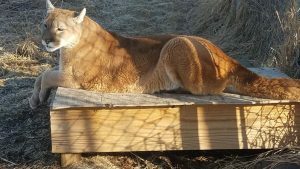 Tasha, the cougar’s, first home was sad . At a young age, she was used for breeding. She lived in a garage for 9 years but one day escaped through a hole in the roof. Her owner didn’t report her escape, fearful Tasha would be killed. But Tasha did finally return, scared and hungry. Read the article here. Then, Tasha went to her second home, living in a 10×20 cage. 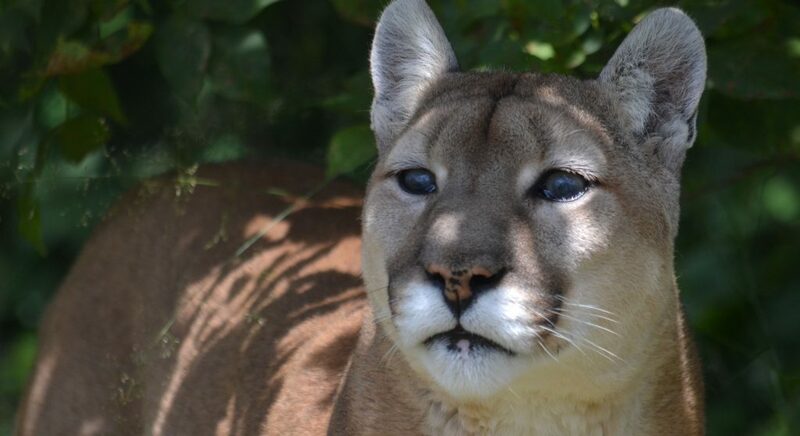 Declawed by her first owner, it has left her tender footed and she also has vision problems. Her current owner says she trembles, shakes, and drools at the sound of machinery near her cage. But with all she has gone through in her 11 years in captivity, she still craves attention from her human caregivers. Tasha’s rescue was covered by the news media nationally. 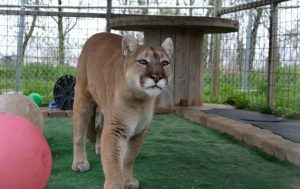 Below, you’ll find a list of articles that detail a lot of what we went through in order to bring Tasha here to her new home at The Wildcat Sanctuary.